When finishing off a swimming pool, you have several different options to consider. Rather than choosing plain concrete, make your pool stand out with beautiful coral stone tiles that will add texture, style and a touch of color to your new swimming pool. It’s durable, attractive, and the ideal choice for all types of custom pools. Pool areas are always damp and slippery, and that can lead to accidents if you’re not careful. Coral stone tiles can be finished with a rough surface that will improve grip and minimize the risk of accidents. Your guests will be able to safely navigate the pool deck. You can take the coral stone tiles right up to the edge of the water and use them for your coping. The end result will look amazing, and you’ll have the traction you need in an attractive finish. Give the pool interior an attractive touch by having some coral stones set into the bottom or the steps. You’ll make the pool safer and more visually appealing by putting a border of tiles right at the edge of each step. You’ll make the stairs easier to see, and you’ll also give the pool a fun finishing touch with coral tiles. Your clients will love the look, and they’ll appreciate that you’re watching out for their family’s safety. There are some color variations in between individual tiles. Most coral stone tiles have a soft ivory color, but the range can spread into shades of pink or light tan. Use these variations to add depth and interest to your space. When installed over a large area, you’ll be able to play up the different colors to make it the centerpiece of your patio. The fossil patterns have hues of red, gold, and white in them, and you’ll love how the color plays out across decks, patios, and pool edges. Whether you’re going for a luxurious finish, a relaxed style, or an upscale look, coral stone is the right choice. It works with all types of decors, and you’ll never grow tired of it. This stone can be used in hospitality projects and backyard swimming pools. If you’re working with a client who wants the best materials along with a relaxing atmosphere, then you’ll find that coral stone is absolutely the right choice. It can truly be all things to all people, so you’ll want to add it to your inventory and have it on hand for your projects. Tile patios are growing in popularity, but your clients may not realize that they can carry the tile right up to the pool’s edge. Eliminating the transition between patio and pool deck will make the entire area feel larger and more welcoming. Your clients will be impressed with your vision, and they’ll love the finished look. You can carry the coral stone tile around the patio and even out into the garden. Forged by nature, this particular material can handle the water, temperature swings, and direct sunlight found out by the pool. Anyone who’s walked across hot concrete in bare feet knows how uncomfortable this can be. Whether you’re located in a hot climate or a cooler one, bare concrete can become painfully hot in the middle of summer. This problem is eliminated when you go with coral stone. The light color allows it to stay nice and cool even when the sun is at its peak. By reflecting the light, it’s able to maintain a cooler temperature that will feel comfortable underfoot. This makes it a top choice among hotels and other commercial centers. Commercial businesses can keep their customers happy and comfortable by going with coral stone that will feel cool underfoot. Residential property owners will appreciate knowing that their families will be safer thanks to the addition of coral stone tiles. Designed by nature, every coral stone tile is truly unique. Tiles are expertly cut to bring out the fossil patterns and add visual appeal. The random look is perfect for outdoor areas where straight lines are rare and Mother Nature is the ultimate designer. This is why it’s a top choice for commercial customers who want to stand out from the competition. It’s also a top choice for homeowners who want a unique finish that looks great and is perfect for exterior applications. Home appraisers look at a ranger of criteria when determining value. This includes the materials used out on the patio. Rather than going with the same items that are found in homes throughout the neighborhood, you can make your mark as a designer and builder by choosing upscale materials. The coral stones will make an impression on your customers, potential buyers, and home appraisers. The end result will be higher property values that effectively reflect the use of beautiful coral stone tiles for the pool and patio. Nalboor Tiles offers quality coral stone tiles in a range of sizes. Choose 12”, 16”, 18”, or 24” square tiles. We also carry 12” x 24” rectangles that are perfect for creating patterns and borders. Perfect for columns, paving stones, staircases, and patios, these tiles are also a grand addition to any pool deck. Water-resistant and slightly textured, they’ll give you the grip that you require for safety. We’re happy to assist you with all types of bulk orders, so you can stock up on these tiles ahead of time. 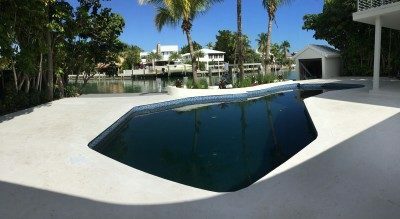 Call a Nalboor Tiles representative at 305-501-4548 to place an order, or just contact us online to start the process today!